I created document and implement some minor UI this week. I created document. 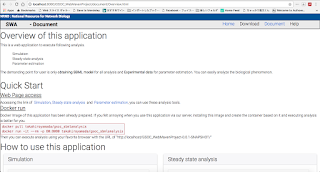 This document contains "Overview of this application", "Quick Start" and "How to use this application. 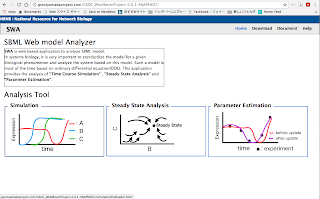 "How to use this application" contains the document of simulation, steady state analysis and parameter estimation. These documents are basically constructed with the detail sentence and image of this application. In these document, user can change it using pagination. I implemented following minor UI. These are advised by my mentor. 1) Just after pressing confirm button in error message, target form is focused on. 2) Input file with ".xml" and ".sbml" ( both upper and lower case) is acceptable. 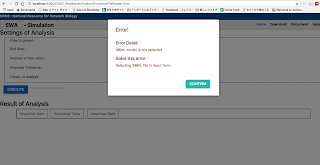 I used bootstrap modal system to pop-up error text in client side. The error message is popping following situation. 3) SBML model is invalid. I used bootstrap modal system to pop-up warning text in client side. The warning message is popping following situation. 1) SBML model has some incorrectness( by checking using the method "checkConsistency" of JSBML class SBML_Validator). Fig1.3.1 : The error message with that file is not selected. I focused on creating Docker image this week. Docker image removes the connecting time to the server because the server in container of Docker is created in local environment. In addition, users are not worried about own model leak to the other. 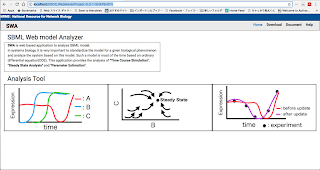 1.2 Setting the form to change the upper and lower bound for kinetic parameters in parameter estimation. My last implementation fixed the lower and upper bound of each kinetic parameter in parameter estimation. However, users sometimes want to change these value because the sensitivity of executing parameter estimation for each kinetic parameter is sometimes different. 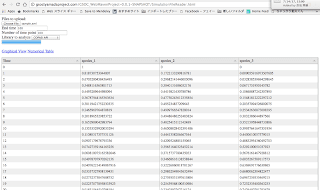 I tried local and global parameters in SBML model can be changed in my implementation. My mentors pointed out following bugs last week. This change let me to maintain these system easily. I created this widget to get the result of each analysis as png format for graphical result and csv format for table result. This implementation is significantly important for users to get actual result and download it in their local environment. 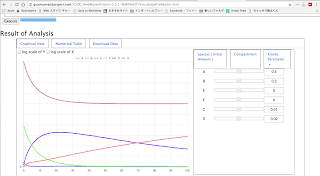 Fig1.3.1 : The download tab is added in the "Result of Analysis"
Fig1.3.2 : After user finishes the analysis and click download tab, download dialog open. The file is zip including all the result of analysis. the result of each analysis is png format for graphical result and csv format for table result. Fig1.3.3 : The result gotten as png format( graphical result). 5. Elaborating the UI of parameter selection. 1.1 The minor implementation discussed last week. I finished following implementation discussed last week. Regarding "4. Grouping species, parameters and compartments in UI of changing these values" , I try to implementation from tomorrow. I used bootstrap to design html. This design can change responsively when the browser is changed or the space of canvas is changed. 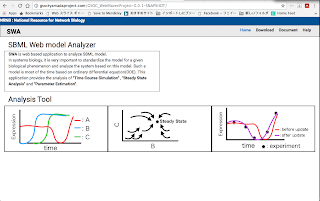 I focused on the implementation of numerical table in the result of simulation and parameter estimation. Fig1.1.1 : The table of simulation result is visualized. Each row refers to time and column refers to the species. Fig1.2.1 : The table of parameter estimation result is visualized. First column refers to the reaction ID and second column refers to the parameter ID. Third and Forth column refer to the start value of this parameter and fitted parameter respectively. I finished this implementation of table. Following table shows my current progress.